This is not about the man but about an idea. I am not voting for Ron Paul. I am voting for the constitution, for life, liberty, and the pursuit of happiness. I am not voting for Ron Paul, but for the principles for which he stands. I am voting for truth and “the American way”, for free markets and capitalism. 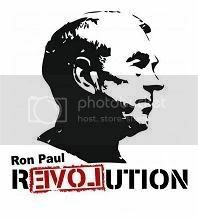 I am not voting for Ron Paul, but for the movement called “the revolution”. I am voting for individual freedom and the right to “pull yourself up by your bootstraps” or take a few lessons from “the school of hard knocks”.